Hyperrealism is one of the visual styles of the twentieth century that systematically and purposefully return to depictive painting (Neue Sachlichkeit, socialist realism etc.). It does so having been enlightened by many styles; modernism, which freed art from the necessity of imitating the external world, abstract art, Duchamp's readymades, avant-garde promoting "art as life", politically and ideologically motivated styles (socialist and "capitalist" realism), minimalism, Noveau réalisme, pop-art, conceptual art, performance art and the principles of technical and media image (photography, film). It defines itself in a certain way in comparison to all those, including the classic realism of the nineteenth century, but it uses and manipulates the tools and means of them all. Hyperrealism is historically connected to the emergence of post-modernism, in connection to photorealism, and it appeared at the beginning of the 1970s, initially in the environment of Western Europe and the United States. It is often interpreted as a subliminal criticism of a late democratic society that has succumbed to the lures of consumerism. Thematically it is similar to traditional (e.g. Dutch) genre painting (Yingzhao Liu and Roberto Bernardi in the context of "luxury", Paul Cadden in the context of "devastation"), landscape painting (Thierry Duval, Rod Penner, Stanislaw Zoladz, Renato Muccillo) and portraiture (Jan Mikulka, Leng Jun, Chuck Close, Clio Newton, Michal Ožibko, Yigal Ozeri). 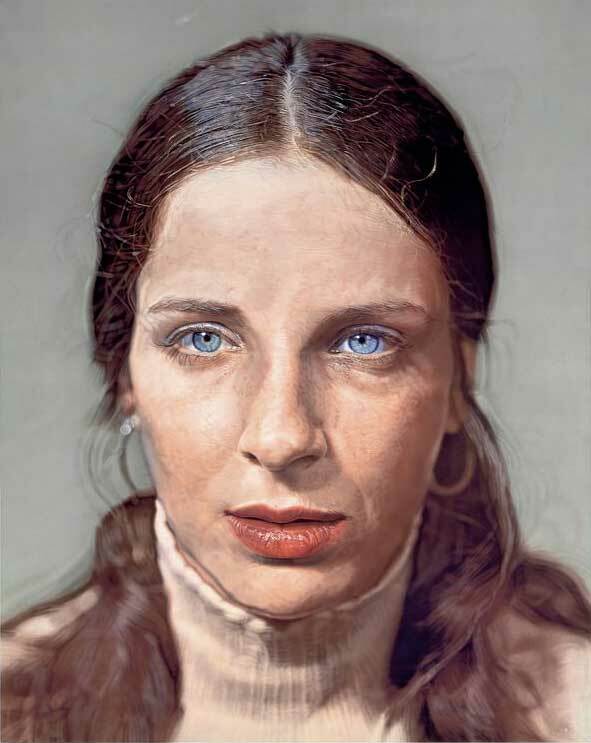 In all cases such motifs are chosen deliberately, the realistic depiction of which requires a high level of skill and thus revives traditional ancient myths concerning artists who are able to deceive viewers through their skill and convince them of the existence of objects that are "just" painted or artificial (Mitch Griffith, Gottfried Helnwein). A high level of illusion, a fascination with the glossy surfaces of cars and modern buildings (Richard Estes, Hisaya Taira), with appliances, food and fruit (Theodor Pištěk, Iban Navarro, Cesar Garcia), changing facial features (Liu Yun Sheng, Tomáš Kubík) etc. are not just a response to the standards of the period and the requirements for the aesthetic qualities of things (people – Robin Eley) which we appreciate most, yet are fatally fleeting (which is even more pronounced in sculpture – Ron Mueck, Duane Hanson, John de Andrea). Hyperrealism is also a latent provocation to elitism - that which we call high culture and all its attributes, and it is also minimalism striving to reduce the quantity of impressions to one common - aesthetic - quality (Bruno Walpoth, Antonio Lopes Garcia, Carlos Garcia Roman, Angus McEwan). At the same time, Hyperrealism turns to the artistic world and the medium of painting. Its evident technical demands are in direct opposition not only to the massively favoured conceptual art, but also to the consumer culture of media images in which digital photography is the most perfect from a technical viewpoint. The difference between digital and analogue photography is often compared to the difference between photorealism and Hyperrealism. While the first concentrates on an existing image which it "copies" - and all the creative activity is connected to the selection of the shot that will be transformed into a painting, Hyperrealism paraphrases the principle of assembling an image. It is connected to the fact that the themes are often selected much more carefully, they are an expression of the artist's attitude to the world, his/her opinion of it - and the result is often socially engaging because it draws one's attention to invisible (lack of equality, racism, urban anonymity and loneliness, environmental devastation of the landscape etc.) or trivialized themes (Denis Petterson, Joel Phillips, Chose Luis Corella, Mike Bayne, Hynek Martinec), or to the artist's experience with the theme, their personal experiences, traumas etc. Thanks to stylistic adaptations (cuts, enlargements, colour tones etc.) the motif is manipulated and the attention of the viewer is aimed in the required direction. In the world that is digital, medial and assailed by images, Hyperrealism has the same visual properties as technical images but with a completely different, traditional, ontology - it is three-dimensional, original and authorial. It is defined by visual interpretation but has a tendency to evoke a full-bodied impression of reality (Vincent Giarrano, Paul Dmoch, Greg Gandy). As opposed to the current endeavour to participate, interact and engage the viewer in the creative process, but also with an appreciation of amateurism, which is perceived as authentic and genuine, Hyperrealism expresses itself in a similar way - radically. However, because of that, and similar to the analytical approaches in philosophy or the latent positivism of the natural sciences, it enables us to ask general questions that define the world of humans - its sensory aspect, its understanding, interpretation, evaluation and organisation.